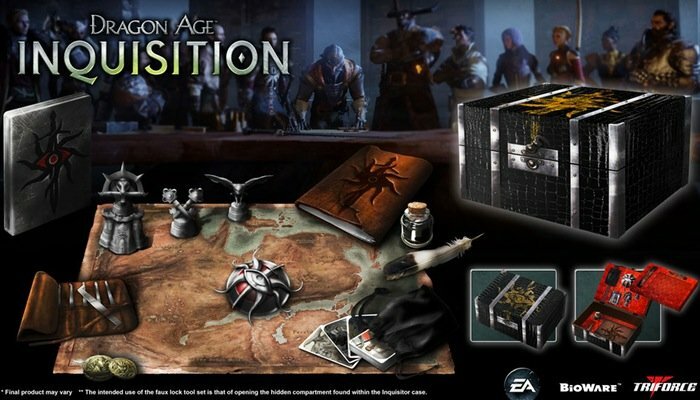 Dragon Age fans considering purchasing the new Dragon Age: Inquisition Collectors Edition might be pleased to know the details have been today released by EA and Bioware on the GameStop website revealing that the box set will cost an eye watering $170. The Dragon Age Inquisition Inquisitor’s Edition as it’s officially named, will be available to purchase from 10th July 2014 and includes a wealth of extras for Dragon Age fans to enjoy. Features of the Dragon Age: Inquisition Collectors Edition include : Highly detailed exclusive Inquisitor Collector’s Edition case produced by TriForce that measures approximately 8.5″ x 13.5″ x 14.5”, the case is individually wrapped in faux reptile skin, has the mark of the Inquisitor stamped on top in gold foil, and with an interior fitted with imprinted red silk. For more information on the new Dragon Age: Inquisition Collectors Edition jump over to the GameStop website for full details of everything you can expect to enjoy in the Dragon Age: Inquisition Collectors Edition.